St. Patrick’s Day is just around the corner and I usually don’t do much for the holiday. I would maybe just throw something green on an and make an Irish themed drink. This year though, I’m really excited for the holiday. I’m excited because even though the official first day of spring isn’t until March 20th, I feel like St. Patrick’s Day is the unofficial start of spring. I know I can speak for everyone in Ohio as well as most of the country when I say, I am totally over winter. This year, I’m going all out with decorations, drinks, and food on St. Patrick’s Day. The lack of color outside has me wanting to fill the indoors with green. In my search, I found and adapted this great craft. It’s perfect for stringing across the fireplace! Cut card stock into strips 1/4 inch wide and 6 1/2 inches long. 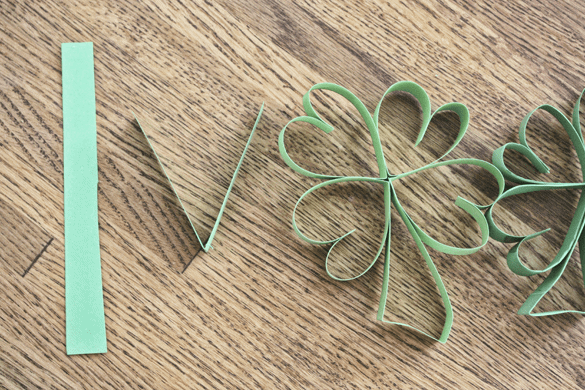 You will need 5 strips of paper for each clover. Fold 4 strips in half and secure into a heart shape with a dot of glue. After you half your 4 hearts, glue those together into the clover shape. With the last strip of paper, fold into a stem shape and glue in-between two of the hearts. 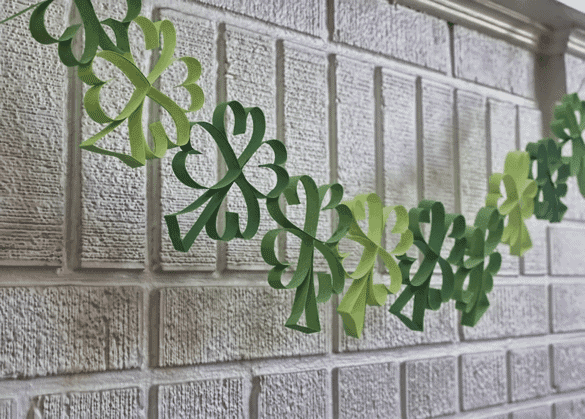 Repeat steps as many times as you’d like…more shamrocks will equal longer garland. 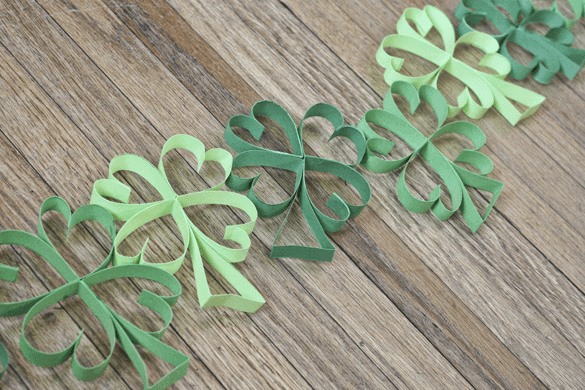 Glue clovers together to create your garland or hang them individually! This is so adorable! A perfect craft to do with little ones!! Thanks so much! Kids would love helping with this! Have a great day. It’s cute, but shamrocks have three leaves. You’ve made a four leaf clover garland. Thanks Margaret, we changed the title. Totally pinned this for next year!